and were apparently produced in 1898. From photos I've seen online, they all appear to be the same make. They have a rounder, slimmer shape with the knob hole closer to the edge than in any other mortise locks I've ever seen. We had an entire bin of mortise locks in the house - none match. Nor do any of the hundreds at the antique store on Third. The Architectural Salvage Warehouse is temporarily closed so I haven't been there, but it seems extremely unlikely they'll have any at this point. 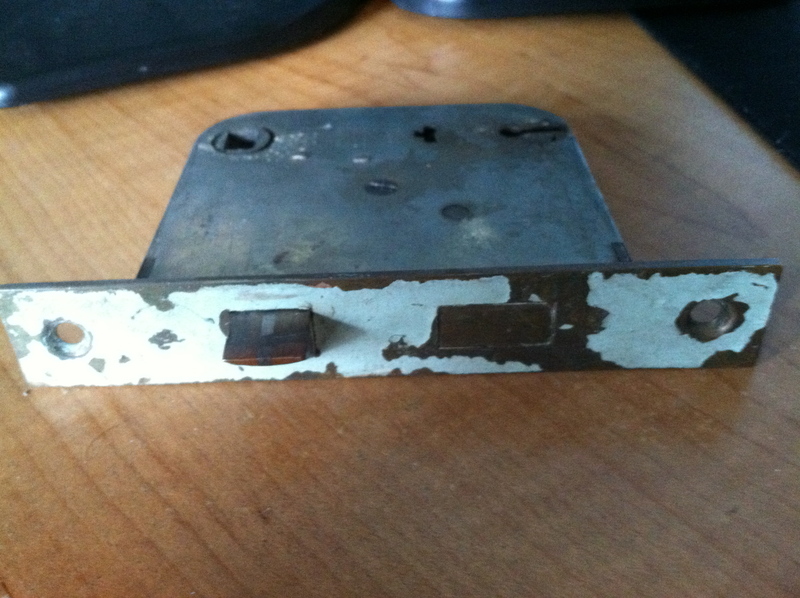 As mortise locks go, I got the kooky rare ones. I currently see one for $15 on Ebay. Beyond that, I haven't been able to find any. If anyone comes across such a thing, I'd be highly interested in getting them. I'm not keen to butcher my original wooden doors to fit a bulkier lock. These were exclusively used on interior doors, as far as I can tell. Again, the defining characteristics that distinguish it, even at a glance, are the proximity of the knob and keyholes to the edge, and the roundness of the corners. Could you post some pictures, measurements and the ebay link? I can start checking places around here. Would a blacksmith have made them custom at the time? There's a few antique shops around here that have old knobs and locks from gutted historical houses. I'll check. I love that they're called Vulcan locks. Yeah, what Anne said. I'll check in Boston and my buddy in Maine to see if we can find any. Added manufacturer & photos to the OP. Thanks! No, they were mass produced. 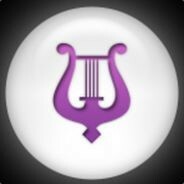 I updated with the company info above. No, notice on mine the distance from the knob to the top is less than the size of the knob opening. It's unusually narrow. No, same issue: the distance from the top to the knob on mine is about half the normal. Im not sure if these are close (c. 1910, but could be earlier). If not, they're local and I'll call them in the morning to see if they have your exact model and if they can send pics. @PirateNinja Nice Actually that page is really confusing. 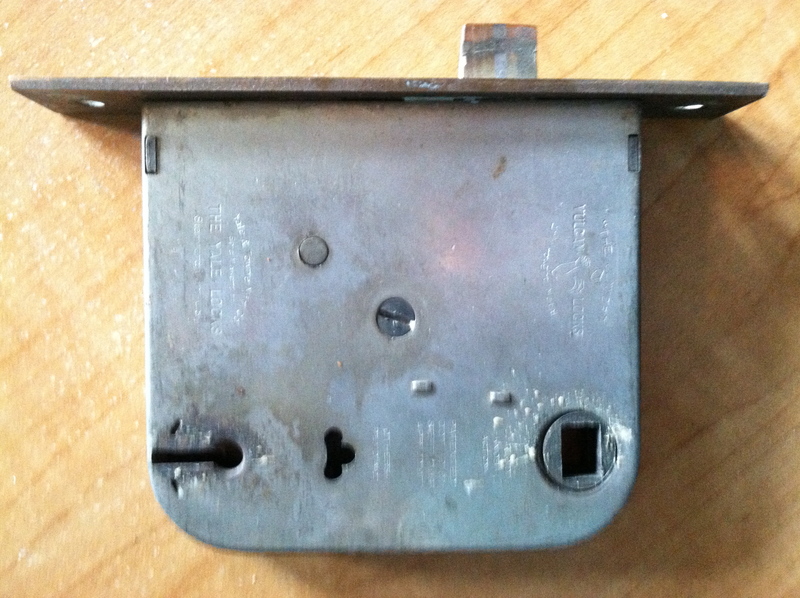 It's all the markings of my locks, but way fancier looking, the back edge looks deeper, and there's no flat faceplate. For $60 w/ shipping it's probably not worth the risk of trying it when I'm not confident about it. Thanks though. @JBoogaloo Nope, the knob is equidistant from both edges on those. Pretty sure this requires a brand match, unfortunately. @Lincoln the ones the @JBoogaloo showed you may work. What you need is a measurement inside the door of where it fits. As long as the keyhole and knob are the same distance apart (to match the holes in the door) then extra material inside the door is irrelevant unless the lock fits exactly in the cavity in the door. Follow? Silly question. Did you call Yale and ask them? Do the six you have now not work? They can be cleaned up and repaired quite easily. 2 are not the same model and don't fit correctly, 2 are missing, and 2 are broken. I may try repairing the two I have. I found a third, but it's rusted to hell. I actually found a fourth working one, which I installed on Perry's door, so I'm down to needing five now. "Attached is a form to fill out with all of the dimensions you require for your passage mortise lock. When we receive the form with the dimensions filled out, we will see if we have what you need." I sent you his email in a pm. 2 of these were on eBay last month and I missed it. EBAY ALERTS FTW. Scored my first one today. And another today! This one with plates & knob. Hell yeah. Achievement unlocked: all quest items retrieved. Still need a pocket door latch and maybe 1 exterior door latch, but they are very different and I haven't pull any apart to figure out what I need yet.